The Visitor is about an alien named Agent Moss, he's from the Omega 1 Earth Abduction Unit. One night over New York City his saucer strikes the Statue of Liberty and malfunctions. After entering the escape pod at the last second, Agent Moss lands in young Danny Myers backyard. Can you help Agent Moss gather the tools he needs in order to phone home? Can you help young Danny Myers finish his chores before his crazy brother throws him another beating? How can a being from another universe, that abducts humans, help Danny Myers miserable life? Lots of puzzle solving, fun animations, 120 sounds, 60 inventory items, animating look and interact icons and hours of game play in this comedy slash drama, with a pinch of spooky on the side. Two playable characters....Danny and the visitor Agent Moss ***Find a way to prank your brother and you will recieve a special cutscene at the end of the game! *** Hope you enjoy! An entertaining game with fairly interesting characters, be prepared to search every area several times to make progress... in all it was quite entertaining and I recommend this game. Brilliant. I downloaded this one near two years back but most of the AGS downloads didnt run on my old laptop for some reason. But seem to work on my new one. So Ive been obsessively playing them for the last few months. This one is a standout favourite for me. 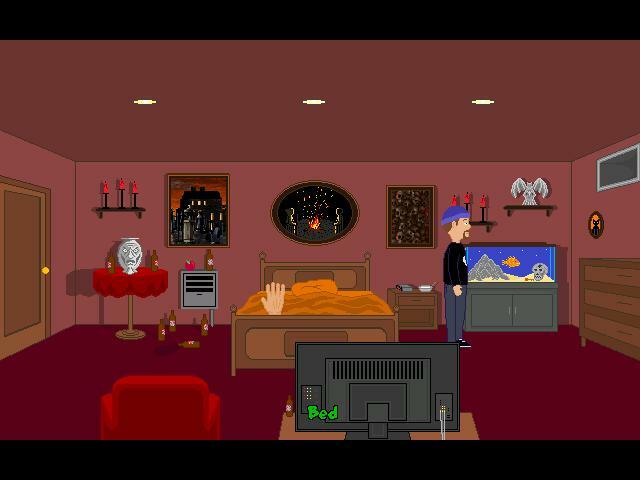 Its bringing the point and click adventure game back to what it was always meant to be. Great humour, puzzles were a mixture of straight forward to fiendish. The storyline itself was a lot of fun too. This is an amazing work for a first game. The rather simple graphics show just the right amount of details, clearly a lot of love was put into making them. The puzzles are designed very well, something you don't see every day. The only thing I was missing was a deeper connection to the characters. I didn't care about them too much. But enough to look forward to play Part 2. A good adventure game with some inventive puzzles and funny dialogue. Great work. One of the best AGS games I've played this year. The humor and the main characters are very nice and smart, the puzzle are godd and logical and the game is long enough. I really enjoyed this game and I look forward to more games from NickyNyce in the future. Great game. Loved the graphic style. Finding items to solutions kept me searching and going bug-eyed. I found the game cute but gritty and well worth playing. Completed it! The game has a very nice graphics style, interesting story and logical puzzles that weren't too easy nor too hard. It also turned out to be lengthier than I had expected. Very good for a first game. Hope to see more games by NickyNyce in the future! I really enjoyed testing this game before its release and I think that it really gives some good entertainment to all the fellow adventure gamers. Bright and funny ideas scattered through all the game make the story immersive and challenging! Looking forward to NickNyce future releases! And here we have the proof: If you take all the classic ingredients of good, old-school adventure gaming (think Maniac Mansion with an alien) and mix them together just right, you get something good. There are some bumps in the road (pacing could have been tighter and there are some pretty long walks between puzzle spots) but that doesn't make the ride any less enjoyable. If you like your good old-fashioned adventure gaming- where even the most mundane task can end in a puzzl chain- check this one out. I recomend The Visitor to all point&click fans. If you want to be entertained by a green naked alien then this is the game to play. What I liked most about the visitor was the clever placed puzzles and its relation with the plot. Solving problems is rewarding on The Visitor, you're using domestic items most of the time and that makes the puzzles logical without being easy. You do need to get your brain working to finish The Visitor and the solid plot and characters drive you to continue. You get to play with 2 characters wich is pretty cool as they are very different and with oposite views about the game world. The author knows how to tell a story and his future on game making can only get better. Logical puzzles, funny and entertaining game, the graphics and animation were very appropriate for the environment. More development on the storyline and plot would have been a good improvement. Well worth playing in my opinion!